2 What Is American Tantric Yoga? The term tantra yoga carries with it a deep notion of sensuality that resonates with all those of us who have heard it before. But in reality, that is just one small aspect as tantra yoga can lead to so much more than that. It allows those who practice it to become one with their bodies, not just physically, but also mentally and spiritually. As a result, the person feels awakened and rejuvenated beyond what can be put in plain words. Couples may be interested to learn some tantra yoga poses to practice. Tantra yoga is a form of meditation that is said to have originated during the 5th century AD in India. Many consider it an art that allows individuals to express themselves with more clarity, both physically as well as mentally. The literal translation of the word tantra is ‘to expand’ , which very well sums up the concept and purpose of tantric yoga as a medium that enables those who practice it to widen the scope of their vision, understanding and opinion of their lives and the world that they live in. Tantra yoga is built on the principle that true knowledge, wisdom and awareness of oneself and of all worldly and immaterial concepts can only be attained by uniting all aspects and dimensions of existence (both known and unknown) into a harmonious relationship that connects us to it on a spiritual level. Tantra yoga opens up the mind, body and soul to a whole new world of peace, serenity and inner confidence by combining two fundamental approaches that form the basis of tantra yoga. One of these focus on qualities such stability, power and rest (shiva) while the other focus on creativity and movement (shakti). What Is American Tantric Yoga? American tantric yoga is a spin off from traditional Indian tantra yoga that fuses together western concepts of meditation and relaxation with the techniques used in the subcontinent. The goals of American tantric yoga are more or less the same but the methodology is slightly different. One way in which the two differ is that American tantric yoga is less physically challenging and hence less risky in terms of sustaining injuries. 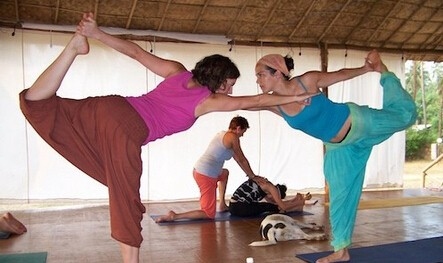 The second difference is that American tantric yoga encourages techniques that allow couples to work together in pairs. This eventually enables them to build a more fulfilling relationship. To help you get an idea of what tantric yoga entails and to help you get started, we have put together a list of some of the most well-known and beneficial tantra yoga poses. You can try these out in the comfort of your home and can work your way up to the more complicated poses. The smaller of the two partners sits on the lap of the other (who is sitting crossed legged) facing his or her partner and crosses his or her legs behind the partners bottom. The backs are supposed to be upright with the eyes directly aligned. Sit opposite each other with legs stretched out. Now join the soles of the feet and raise legs upwards without bending while bending forward and holding hands on the side of the legs. Breathe in and out slowly. This pose reminds one of ballet dancers as both partners start off facing each other while holding one hand, using the other hand to pull their legs up behind them from the ankles or the shin. For increased balance, you may lean in towards your partner or ask them to hold you up if needed. Both partners should sit cross-legged with their knees touching. Move your right arms forward and bring your left arms from behind your backs towards the front as far as possible. Now you must hold each other’s opposite hands which can only be accomplished by bending sideways by your waists in opposite directions. Hold still and then change positions to repeat. This is a very relaxing position that stimulates blood flow to the brain. One person must first get into the downward facing dog position after which the other then stands about a foot and a half in front of him. Now bend down and place both palms on the floor and raise one leg and place it onto the other person’s back. Do the same with the other leg and get into balance. Then slowly move your feet towards your partners lower back and hold position. While practicing these, it would serve you well to keep a few key things in mind. Your primary focus should be on establishing a strong non-verbal connection with your partner. Talk about what you feel comfortable with beforehand and communicate with each other constantly. You may modify the poses in the beginning, especially if flexibility or balance is an issue. Be patient and supportive of one another and assist each other through any challenges that come your way. Remember: quality over quantity, so make sure whatever little time you take out of your schedule for this purpose is spent well. You should not have any preconceived notions or expectations. Consistent mental presence is a must. Dare to explore, sample and survey. Do not be afraid to share your feelings with your partner.